Panini Football 2011 covers all the Belgian football: Pro League, Division 2, Division 3, and Women's league. Each Pro League team has three pages and 28 stickers! These stickers are: shining club badge, team photo (2 stickers), top player in action, home kit (fabric sticker), away kit (fabric sticker), the coach, and 21 players. There is no transfer set or update stickers in this collection. The great feature of this album are the fabric stickers for the home/away kit and that the top player has two stickers, one action and one portrait. 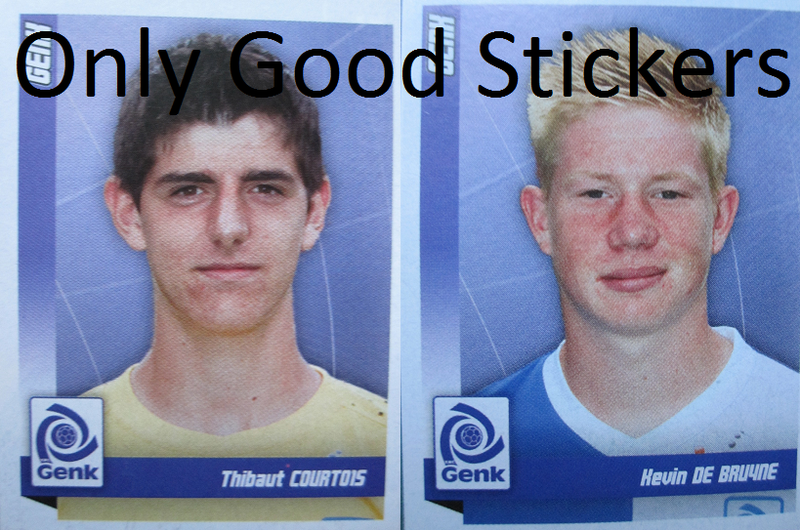 We have to mention the exceptional team of Genk with two young prospects like the goalkeeper Thibaut Courtois (now at Chelsea) and the offensive midfielder Kevin De Bruyne (Chelsea, Wolfsburg). The birth date of De Bruyne is erroneously written as 12/10/1987, whereas he was born on 28/6/1991. Division 2 teams (EXQI League) have only two stickers: the team photo and the shining club badge (half sticker). The same for Division 3 teams, which are divided in two leagues, and the Women's league teams. There are no extra sections.